It turned out to be an elections publicity stunt to get people to vote ANC. President Cyril Ramaphosa on Thursday morning uploaded an initially strange-looking image to his official Twitter account, which led many to believe it had been hacked. Every single word from what looked like an ANC message appeared to be censored. However, minutes later, a second tweet made it clear the first one was intentional, and was possibly intended as a reminder of how the letters of detained or imprisoned struggle fighters had been censored during apartheid. The ANC president was playing this apparent game with his followers in celebration of Human Rights Day, which takes place on the same day as the Sharpeville Massacre of 1960, an event that began to turn world opinion against the apartheid government. 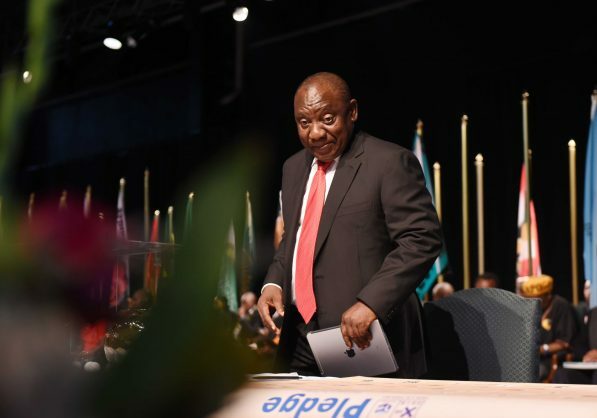 Ramaphosa asked: “What are human rights?” but much of the responses suggested people are currently more interested in having uninterrupted electricity supply and other services, which a few told him the ruling ANC has been struggling to give them. Access to clean water, safety, healthcare and dignity. Basically the stuff the ANC can’t deliver. Ok now I think I understand where you’re going. I thought your account was sabotaged and sinister forces were at play. As the morning continued, the message from the president became clearer, as the blanked-out words appeared. The full message turned out to be a quote from late singer Miriam Makeba, whose freedoms were curtailed under apartheid. Ramaphosa said the country now had freedom, and that was why he would be voting for the ANC. Miriam Makeba had her freedom of movement denied by the Apartheid state. U also have freedom to have lied to us about handling Eskom issues when u were in charge. Anc has become a great lie. U got stuck in a train and pretended that u did not know it happens hourly. I don't think u can be trusted with anything u say. U have been part of this for long. Now the entire South Africa has their freedom of movement denied by the ANC and Eskom.